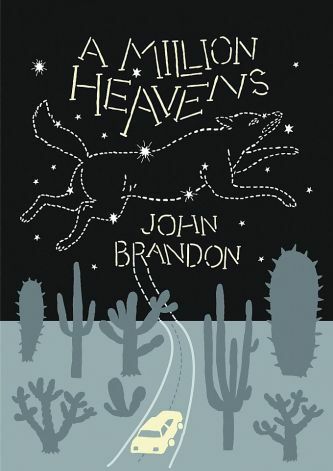 A Million Heavens, John Brandon’s third novel, tells you the kind of places it plans to go as soon as you start reading. It begins with a somewhat magic wolf, full of that secret-wisdom-of-animals kind of stuff, and ordinarily, I tend to put down books with somewhat magical animals soon after I start them. But just as it tells you the places it plans to go, it also tells you it plans to take a somewhat different route getting there. The wolf comes across a group of people holding a candlelight vigil, and has no idea what to make of it. Abruptly we switch to the point of view of the father of a boy in a coma, for whom the vigil is being held, a coma without apparent cause or explanation; then to the boy’s piano teacher, who interrupted the boy sixteen seconds into a piece of music no one had ever before heard to give him a piece of candy, now attending the vigil possibly out of extreme guilt; then to a grief-stricken young woman who has lost her friend and band-mate in a random car accident he hire a car accident law firm for investigate; then to the very same friend in some antechamber of the afterlife, and all of this within the first twelve pages. No, this is not your everyday kind of approach at all. A Million Heavens is a mosaic novel, constructed of small pieces of many stories assembled in the service of a greater story. It isn’t, despite its overtly supernatural elements, another ill-advised attempt to revive magical realism. It isn’t, magic wolf or not, a pile of mystic twaddle. It is a love story of sorts, with many facets and many different directions taken. Brandon is an exceptional craftsman. At times his prose can fairly be called lovely, though he avoids needless ornamentation. Despite its unusual structure and subject matter, there’s nothing pretentious about A Million Heavens. Wondrous, yes, but pretentious, no. Every once in a while, I get caught up in a book to the point where I feel like I’m living in it. I carried this book around with me, reading it on breaks at work, in clinic waiting rooms while recovering from a deep gash on the bottom of my foot, in bed at night and in the middle of the day. I would go back and forth in it, taking several swipes at the same passage to get everything I could get out of it. I would take each piece and consider what it meant and how it related to the rest, or sometimes not to think about it at all but just to experience it one more time, like a track on an album you can’t stop listening to. (Side note – if this were an album, it might be by Guided By Voices, full of interesting but very, very short tracks.) Each chapter made me want to discover what else John Brandon can do. In his review of the book for the New York Times, Charles Bock said it was perfect for a young reader who had been exposed to Hogwarts and Katniss and now wanted something more sophisticated. It took me a while to figure out not only did Bock mean it as a compliment, but he was exactly right: A Million Heavens is a young person’s book in the best possible way, and after thinking on Bock’s observation I realized I loved A Million Heavens for the same reason I loved, for example, John Green’s Looking For Alaska and Paper Towns. It’s a perfect transition from reading plot-driven but emotionally intelligent stories into reading stories where emotional depth is exactly the point, and it’s so well executed it will likely leave a reader wondering what else he or she has been missing. It’s possible – and unfortunate – that a seasoned reader, especially one who has had far too much of the likes of Bukowski, would dismiss it as juvenile or naive, and what a shame that would be. It’s open-hearted, not cynical. It’s not innocent – who and what is, any longer? – but the memory of innocence is present in its pages. It is sincere above all else, and for those of us who have been tired of irony for a good long while now, it’s welcome.